An unscientific – to the point of being casual – survey of watchmakers over the years has reveal that John Harrison is the most highly regarded watchmaker of the past. Harrison This article about restoring his timekeepers appeared in IW Magazine in 2011. The editor who worked with me was Jonathan Bues. As proof that the world is small (at least the horological world) Jonathan and I are from the same town and attended the same high school. Jonathan Betts may have the world’s best horological job. As Senior Specialist in Horology at the UK’s Royal Observatory in Greenwich, just outside London, Betts gets to spend months picking the brain of a genius: John Harrison. As recounted in Dava Sobel’s bebestsellerLongitude: The True Story of a Lone Genius Who Solved the Greatest Scientific Problem of His Time, Harrison created the first marine chronometer enabling sailors to determine their exact position at sea. Sobel’s book details Harrison’s battles with the Board of Longitude established by the British government in 1714 to dispense money for chronometer R&D and award a huge monetary prize to the successful inventor. Betts’ brain picking is not some ghoulish undertaking. Harrison’s brain and the rest of his body remain intact and untouched in a small London churchyard. 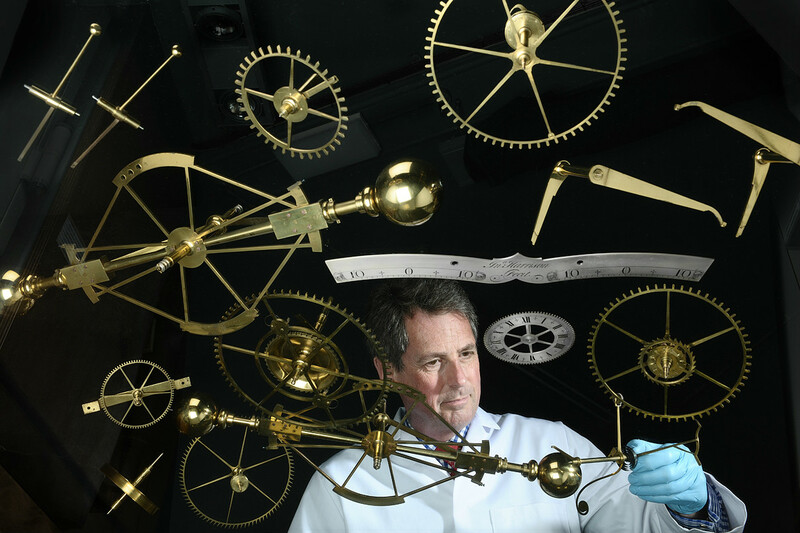 For Betts picking Harrison’s brain consists of disassembling the four Harrison marine chronometers in the Observatory’s care: H1 (1737), H2 (1741), H3 (1759) and H4 (1760). Before reassembly every component is studied, measured, sometimes weighed, researched to determine its material, exact function and origins, and then photographed. Other then some of the photography, Betts is doing the job entirely on his own. Along with his horological skills he approaches the assignment with insights acquired while writing two books: Harrison, a study of the man’s output packed with technical details and Time Restored, a biography of Rupert T. Gould who restored Harrison’s timekeepers in the 1920s and 30s. Working on the Harrisons is part of a project begun in 2007 and due to finish in 2012, cataloguing the Royal Observatory’s collection of 210 marine chronometers. And, to mix metaphors recklessly, the jewels in the crown of the flagship catalogue are Harrison’s timekeepers. Most chronometers have only a few hundred components so Betts completes the cataloguing process in a day or two. Harrison’s timekeepers are far more complex. H1 has 5,500 including the 4,000 bits of the two fusée chains. H2, with only one fusée chain, has 2,160 pieces. Cataloguing both took six months. Betts estimates that cataloguing H3 and H4, which he plans to start in 2011 will keep him busy for four months. Betts’ intimate involvement with Harrison’s masterpieces has led to a controversial theory, a failed attempt to solve one mystery and speculation about the answer to another. The theory concerns the most striking feature of the four Harrison timekeepers when seen together in one of the Observatory’s galleries. You might say you’re looking at the parade of the incredible shrinking marine chronometers. H1 measures 63 cm high, 55 cm wide and weighs 34 kg. H2 is larger; 66 cm high, 56 cm wide and 39 Kg. H3 is 59 cm high, 30 cm wide and 27 Kg. All three machines deserve the title ‘sea-clock’ that Harrison bestowed upon them. Next to these leviathans the sight of H4 is a shock. It’s a large pocket watch with a diameter of 13 cm and weighing 1.4 kilos. Harrison dubbed H4 and his next timekeeper, the even smaller H5 (1770), ‘sea-watches’. (H5 is in the Museum of the Worshipful Company of Clockmakers in the City of London.) Staring at H4 it is impossible to resist asking: Why the jump from clock to watch? Betts believes the answer is proof of Harrison’s genius and courage: seeing that the obvious conclusion was wrong he changed direction. To win the Longitude prize the Board demanded accurate time keeping to within 2.8 seconds a day during six weeks at sea. The best watches of the 18th century lost or gained about a minute a day. The best clocks lost or gained about a second a month. Harrison reached an obvious conclusion: only a clock could win the prize. Bett’s theory about Harrison’s progression from clocks to watches revolves around oscillators. In the 18th century must clocks had pendulums as oscillators. Harrison realized early on that pendulum clocks would fail at sea so he equipped H1 and H2 use two linked bar balances, that resemble dumbbells, swinging in anti-phase (toward and away from each other) as oscillators. Harrison hoped his two balance system would counteract the adverse effects of any external disturbances, such as violent ocean waves. Disappointingly for Harrison the linked bar balances failed to perform to his expectations. So, on H3 the balances are two linked wheels, one positioned above the other. After testing H3 Harrison realized he was headed for another failure. Betts hypothesizes that Harrison’s thinking travelled the following path: marine chronometers are, by nature, portable timekeepers subjected to huge external disturbances. To function accurately a marine chronometer must be able to withstand these disturbances. Clocks are by their nature ‘fixed’ in one place, therefore a marine chronometer mechanism, particularly the oscillator, based on a clock mechanism would not withstand such disturbances and will fail. Watches by their nature move, are subjected to external disturbances and continue to function but not as accurately as clocks. The solution: improve the watch. Crucially, according to Betts, Harrison spotted the reason for the poor performance of watches; they were self-starting. Watches in Harrison’s day were fitted with light, small balances, beating at the slow rate of once or twice per second. When a watch stopped the power of the escapement was sufficient to start things up again after a simple winding. Harrison kept his intentions hidden until the last possible moment. In November 1761 H.M.S Deptford sat in Portsmouth harbor ready to sail for Jamaica. The purpose of the voyage was the sea trial of both H3 and H4. Harrison arranged for H3 to stay behind. Only H4 sailed on the Deptford. H4 has a heavy, circular, steel balance measuring 5.7 cm in diameter and beating five times a second. To create H4 which Betts sees as, “Not just the first marine chronometer but the first precision watch, the Mona Lisa of watches”, Harrison broke the cardinal rule of 18th century watchmaking. H4 is not self-starting. Because of the size and weight of the balance, after winding the watch needs a little turn before springing to life. If H4 is the Mona Lisa of watches then the two diamond pallets on its modified verge escapement are the famous lady’s inscrutable smile. On a standard verge escapement the pallets are placed at 90 degrees to each other. On Harrison’s version the two pallets are parallel to each other. The pallets are 2mm long and have a semi-cylindrical shape, curved on one surface flat on the other. The teeth of the escape wheel act on both surfaces. The curved surface is perfectly smooth and there lies the enigma: it is virtually impossible to cut and polish diamonds into a smooth curve. Under a microscope the surface of a curved diamond reveals an octahedral structure, a series of shapes with eight faces. Attempt to polish those shapes with traditional diamond paste and some areas will wear away more quickly than others. The result is a surface with a several facets and not a smooth curve. The secret of the pallets has even eluded the über hi-tech investigative skills of Cambridge University’s Cavendish Laboratory. The Laboratory designed tests to determine three things about the pallets. One: are they really diamonds? If not and the pallets are another stone such as sapphire then obtaining a smooth curve is infinitely easier. Two: Did whoever made the pallets understand the basic crystalline structure of the gems? Did the polisher know that the process of crystallisation on the surface of a diamond always occurs along a particular axis. Only someone familiar with diamonds, would know how to orient the stones so the roughest surfaces are polished first. Three: How were the curved backs polished? Before the tests Betts theorized that the diamonds were polished longitudinally; pulled and pushed up and down in a tiny device shaped like a rain gutter. The answer to questions one and two are definitely yes. The pallets are diamonds and the polisher understood perfectly the axis of crystallisation. Question three remains unanswered. Examining the pallets under a 50x microscope did not show the longitudinal polishing lines Betts had speculated about Harrison did not use a miniature rain gutter. Instead the polishing lines are latitudinal indicating that the polishing was done in a circular fashion employing a rotating or spinning method. Other than that broad conclusion the stones are silent. Another tantalizing mystery associated with Harrison surrounds the timekeeper known as the ‘Lesser Watch’. Lesser in Harrison’s day meant smaller and he described the watch as “Of such a size as may be worn in the pocket.” The Board awarded Harrison money to make the watch. He prepared a construction drawing for the movement and refers to the watch in his writings. Where is the Lesser Watch? Charles Tearle a director and watch expert at Antiquorum in New York believes that because none of Harrison’s work have ever come onto the market it is impossible to estimate the value of the Lesser Watch. Beyond the fruits of picking Harrison’s brains Betts looks forward to the marine chronometer catalogue accomplishing a worthwhile goal: “One big remit for the catalogue is to make the collection accessible both physically and intellectually to the general public and the specialist. We have such a good collection and it is so comprehensive across the chronology of the marine chronometer that the catalogue will serve as a new history of the marine chronometer.